When Sue Washburn discovered that a check from the back of the family checkbook had been written to someone they didn’t know and cashed for $200, it quickly raised a red flag. The pastor at Reunion Presbyterian Church in Mt. Pleasant, PA, soon realized more checks had been ripped out, and after talking to police, she and her husband noticed that some jewelry and tools were also missing from their home. A community mourns the loss of loved ones to addictions at a service on the National Day of Remembrance at Westminster Presbyterian Church. A similar gathering will be held March 26 at Reunion Presbyterian Church in Mt. Pleasant, PA.
As it turned out, Sue’s neighbor had been breaking into their house and making money from what he had stolen, most likely using the cash to buy drugs. It was a wake-up call for Sue as to the depth of the drug problem that continues to grow in her small community and others like it. “It looks like the heroin problem is biggest in Appalachia – western Pennsylvania, West Virginia, eastern Ohio,” Sue said. “It seems to be the biggest region where heroin and other opioid addiction is a big problem. 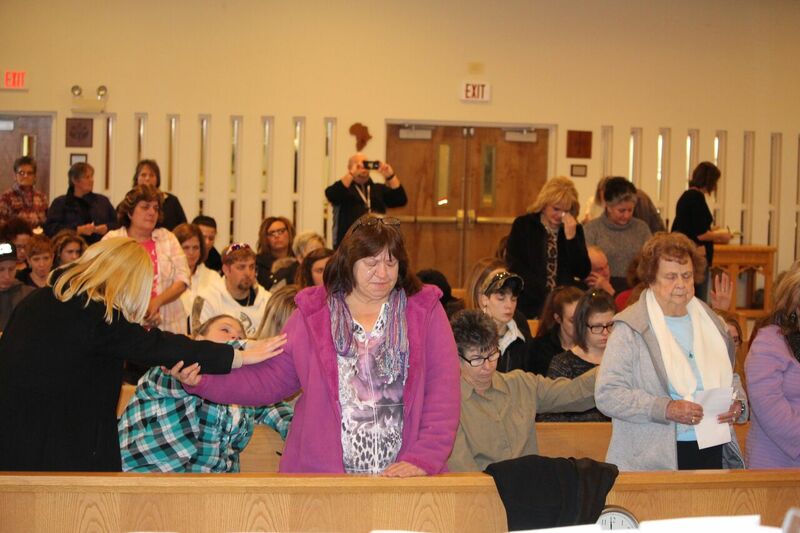 A second encounter occurred a short time before the robbery when Sue was approached by a former Sunday school student who admitted that she was addicted to heroin. The friend asked for help in breaking the habit. Feeling called to do more, Sue brought up her recent experiences at a Presbytery of Redstone council meeting last summer. It sparked plenty of conversation within the group and led to the formation of the Addiction Ministry Network in the presbytery. 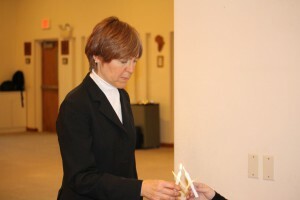 One of the projects the group organized was a Lenten devotional (available here). The 47-day reading, titled “Into The Light: Join The Conversation,” is available on the “Redstone Together” presbytery blog and aims to encourage people to come into the light rather than live in fear and darkness. Rev. Donna Havrisko, pastor of Westminster Presbyterian Church, shares the light of Christ at a candlelight service planned by the Westmoreland County Drug and Alcohol Commission. Donna and other members of the Presbytery of Redstone are working with the county to learn how they can help with the addiction problem in their area. In constructing the devotional, Lee went through the lectionary for Lent and singled out passages in the Bible that related to addiction. He then reached out to area pastors and other church leaders to write the devotional’s selections, picking people who are either struggling with drug addiction in their own congregations or have a personal experience with it. “The more voices that we have together and the more people talking about this, my belief is that the Holy Spirit is going to lead us to know what as congregations we can do regardless of size and where they can lend support to this whole endeavor,” Lee said. Lee knows all-too-well about the drug situation. For 20 years prior to entering the ministry field, he was a counselor in a drug and alcohol rehabilitation center. That experience made him realize that those coming out of rehab are most likely not going to talk to their pastors about their situation. However, Lee found out that this connection between the church and the recovering addict went both ways. Lee’s goal is to get pastors to talk about drug and alcohol addiction in the pulpit so that if someone in the congregation is struggling with addiction, he or she will know where the pastor stands and hopefully feel comfortable approaching the pastor with his or her situation. In Lee’s first call after leaving the rehabilitation center, he established a group of pastors in Logan, WV, to discuss and address the problems of addiction. Since moving to western PA, he hadn’t been able to organize the same until recently having a hand in the Presbytery of Redstone’s Addiction Ministry Network. “I’ve always tried to encourage churches that this is an important issue that we have to be talking about as a church,” Lee said. “This is an issue that directly speaks to redemption, salvation, forgiveness and resurrection. People have these absolutely wonderful stories of redemption but our churches don’t seem to be willing to listen to them, and they’re missing out on something wonderful. A second project by the Addiction Ministry Network was the formation of an “Into The Light: A Service of Healing and Hope” worship service, which was held at Reunion Presbyterian Church. It was a fitting location since Mt. Pleasant has the highest percentage of overdose deaths of any community in Westmoreland County. 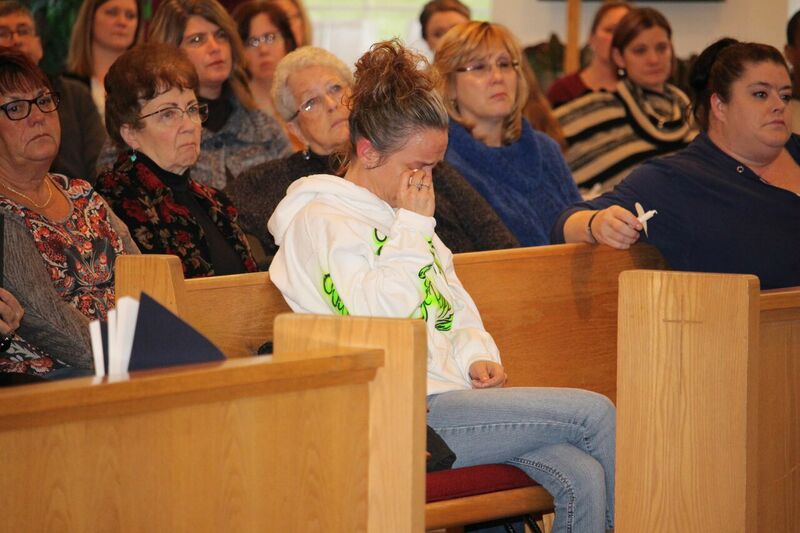 The service included testimonies from three women who have been touched by addiction. A woman weeps for a loved one at Westminster Presbyterian Church during a service on the National Day of Remembrance. A week or two after the service, the Addiction Ministry Network is planning to meet to discuss the impact of both the service and the devotional to see what steps should be taken next. The hope is that this type of service will rotate between the four districts in the Presbytery of Redstone in the coming months. Westminster Presbyterian Church of Greensburg held a similar gathering for the National Day of Remembrance in late January. Organized by the Westmoreland County Drug and Alcohol Commission, the event included music by Sage’s Army, a group that brings awareness to drug addiction, a slide show of loved ones who have died because of drug abuse and an “angel-versary,” which consisted of paper doves being displayed with the names of those who have passed on because of drug addiction written on them. At a lecture at the University of Pittsburgh-Greensburg, Sue heard a presenter explain that drug use has exploded because the medical community has been increasingly prescribing more pain medications to patients. It has been leaving more people with addiction problems who need to get their fix on the streets when their prescriptions run out, the presenter said. Because heroin is cheaper than other pain meds, that drug has been increasing in demand. “The quality (of the drugs) is getting better and the price is getting cheaper, so they expect that the problem is going to continue,” Sue said. Raising awareness has been the signature for the Lenten devotional and gatherings, but there is still plenty of work to be done in order to get this problem under control. The right steps are being taken to get help to those in need, and having a faith element as the backdrop can only help the cause. “When I look at the ministry of Jesus, what I see is love and compassion and caring for people who are suffering,” Sue said. “Sometimes it’s because of the mistakes they have made, sometimes it’s because of things that have happened that are beyond their control. But what Christ seems to offer is a reconnection to the community and to God. So often when people are addicted, they suffer alone, and we’re trying to be that community of Christ to offer them a way of reconnecting with the world in ways that are helpful and allow them to flourish.